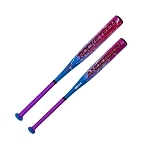 Baseball & Softball Bats • Discount Prices • Free Shipping! It's awful hard to practice your hitting without a decent softball or baseball bat. Sure you could pick up an "el cheapo" from WalMart but if you really want to become a good hitter, you need a good bat! Whether you choose a softball bat or a baseball bat, all of our bats are top quality and approved for league play, We offer bats for youth baseball, slow pitch softball and fast pitch softball. 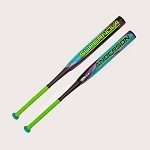 We have even added a special lightweight fast pitch softball bat, designed to help young girls transition from tee ball to live, fast pitches. Select from various different baseball bats and softball bats, below, and be sure to scroll to the bottom of the page to learn more about the bats we offer here. Currently, we are carrying only the Anderson line of bats. They have long been known for their durability and superior construction. No bat gives you more "pop" for the money! All bats sold on this website ship free and are guaranteed to have the lowest price available online. We stand behind our bats, too; all bats feature a one year manufacturer's warranty and 30 day satisfaction guarantee.